Eighteen African countries held presidential, primary, or legislative elections in 2011. Elections in eleven of these countries were marked by violence that ranged from low-level intimidation and harassment to more intensely violent displacement and death. Electoral violence of any kind can deter citizens from voting, discourage candidates from running for office, weaken civil society’s scrutiny of elections, and hurt the legitimacy of a government. 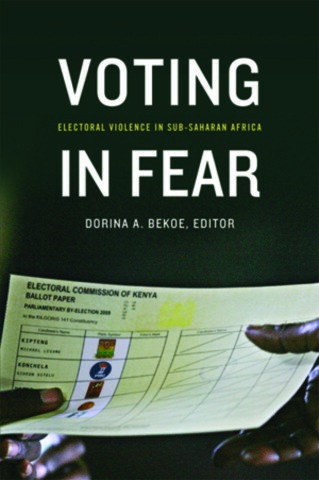 In Voting in Fear, nine contributors offer pioneering work on the scope and nature of electoral violence in Africa; investigate the forms electoral violence takes; and analyze the factors that precipitate, reduce, and prevent violence. The book breaks new ground with findings from the only known dataset of electoral violence in sub-Saharan Africa, spanning 1990 to 2008. Specific case studies of electoral violence in countries such as Ghana, Kenya, and Nigeria provide the context to further understanding the circumstances under which electoral violence takes place, recedes, or recurs. Combining issue-driven research with in-depth empirical insights, contributors link electoral violence to past histories of violence, close elections, a state’s declining economic fortunes, and weak institutions. Filling a gap in the existing literature on electoral violence, Voting in Fear offers concrete recommendations on how international, regional, and local institutions can help reduce or prevent electoral violence. The volume concludes on a hopeful note: Electoral violence is not inevitable, and understanding the political context in which an election takes place is critical to predicting and forestalling violence.